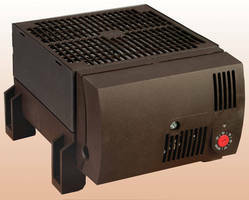 Fan Heater is equipped with built-in temperature limiter. Offered in double insulated plastic housing, CR030/130 series fan heater comes in DIN rail, panel, or foot mountable unit with integrated adjustable thermostat or fixed hygrostat. Suited for automotive and petroleum industries and applications involving food processing, CE compliant product maintains minimum operating temperatures in enclosures and helps to prevent failure of electronic components caused by condensation and corrosion. The CR030/130 has double insulated plastic housing and can come as a DIN rail, panel, or foot mountable fan heater with integrated adjustable thermostat or fixed hygrostat. It conveniently comes equipped with a built-in temperature limiter. This CE compliant product maintains minimum operating temperatures in enclosures and helps to prevent failure of electronic components caused by condensation and corrosion. Perfect for automotive and petroleum industries and ideal for applications involving food processing.